Tia Maria copper mine has been stalled since 2011 due to the protest from the residents claiming that the working of mine may contaminate the drinking water facility of the neighborhood. As the mine being one of the biggest mining projects issued in Peru, the ministry has not decided letting go off the project easily. Mines and Energy ministry of Peru announced on Monday that the environmental impact study based on the project has been approved by the government. Many Projects in Peru has been put on hold due to the violent protests held by the residents and environmental activists. Even though Peru is a large reserve of minerals like gold, silver, zinc and copper, due to these protests and hardships from the residents, nothing is fully utilized. 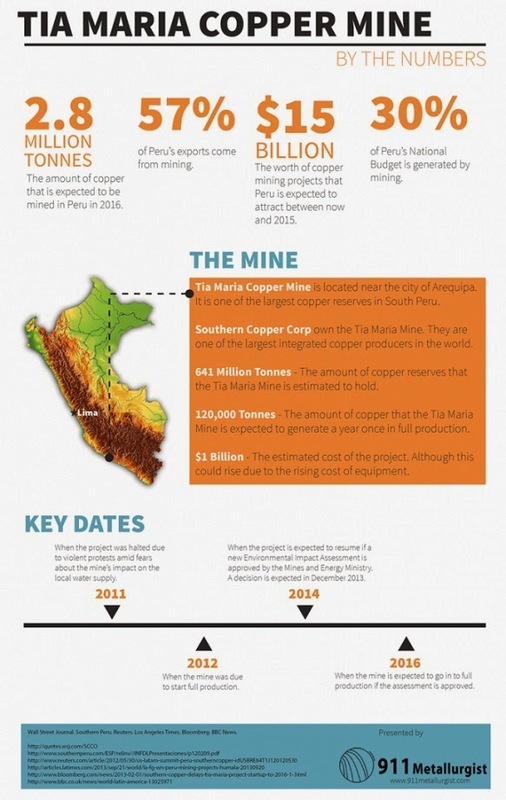 One of the world’s biggest producer of copper, Southern Copper have stated that, the project Tia Maria will annually produce at least 120,000 tons of copper and will last for at least a period of twenty years. Oscar Gonzalez Rocha, the chief executive of Southern Copper said that they are hoping to start the production at Tia Maria by 2017; mostly at the beginning of the year. He also added that, the company is still to receive the license for the project. The project is to be launched at the Southern part of Peru; precisely at Arequipa region. The construction of the plant was stopped due to the protests held regarding the pollution caused by the plant. According to the government of Peru, the country will most probably produce 2.8 million tons of copper by the year 2016, which is almost double the production of present year, as the government is expecting number of new projects to start their production.